Mostra i risultati per narratore "uncredited"
The cover story this month is "Getting Past Yes," which discusses the importance of negotiating while keeping the future of the deal in mind. The second story this month will show you how to navigate the unexplored yet bountiful territory of one-on-one executive coaching. 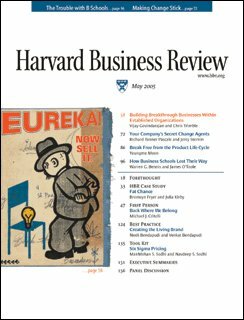 The HBR Spotlight section this month focuses on 21st century supply chains, and contains two articles. In this article from Harvard Business Review, Harvard professor Chris Argyris says that, despite all the talk and the change programs, empowerment is still mostly an illusion. The author describes how change programs increase inner contradictions, how CEOs undermine empowerment, what is to be done, and more. This article, which originally appeared in the May-June 1998 Harvard Business Review, is offered in audio form exclusively through Audible. This month's cover story asks "Is Silence Killing Your Company?" All too often, behind failed products, broken processes, and regretted career moves are people who chose to bite their tongues rather than speak up. Such silence can be catastrophic. But, you can break the cycle silence. 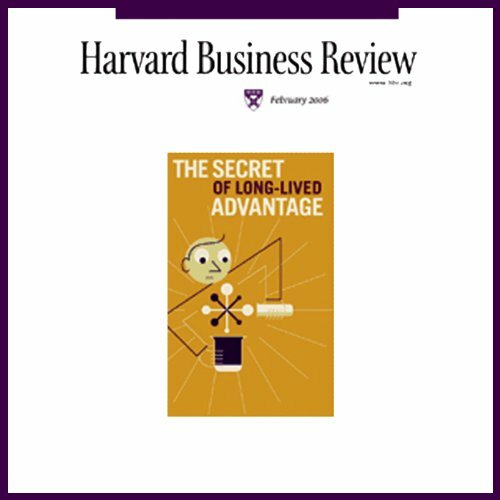 Also in this edition of the Harvard Business Review for May 2003: the high cost of accurate knowledge, learning to hedge your customers by diversifying your customer profiles, and more. Turnarounds that result in companies coming back from a decline almost always are very difficult on staff and managers alike. Rosabeth Moss Kanter offers leadership strategies that will help guide a company through the difficult path back to success. Also in this issue: a look at how commitments to employees, customers, and investors may be holding you back from taking tomorrow's challenges, why keeping your B-players happy is important, writing tips from screenwriting coach Robert McKee, and more. New and improved! 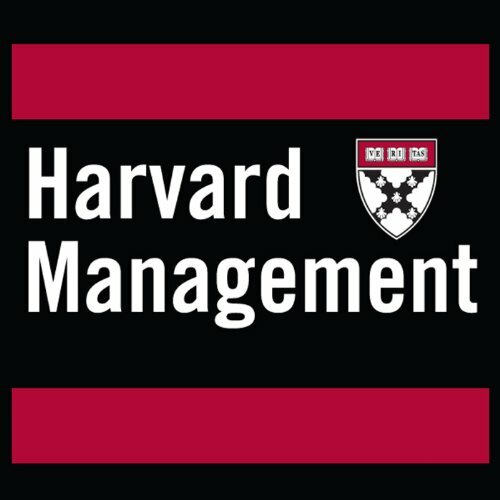 Beginning this month, Audible's audio edition of Harvard Business Review features commentary by Senior Editor Gardiner Morse. Plus, Audible and HBR have selected a better mix of content, to help you take away more learning and wisdom from each issue. As protectionist barriers crumble in emerging markets around the world, multinational companies are rushing in to find new opportunities for growth. To local businesses this can seem like a death sentence. 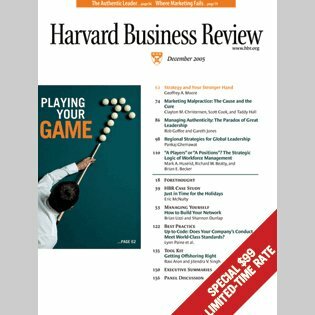 This article from Harvard Business Review explains how they can overcome - and even take advantage of - their differences. 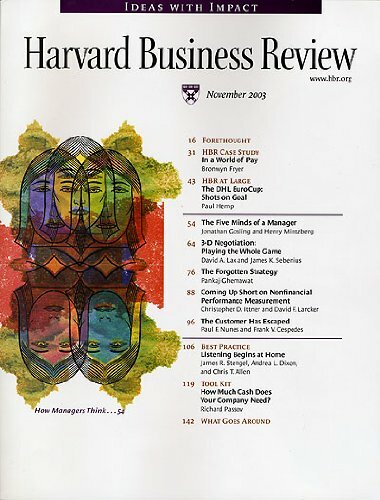 The challenge of identifying and hiring effective CEOs; the benefits of productive friction in a business relationship; the ethics of nonprofit companies seeking profit; great ideas for implementing real change through coherent persuasion; and Executive Summaries of the remaining articles in this February 2005 edition of Harvard Business Review. 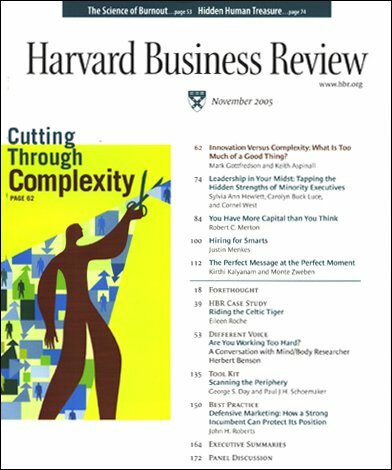 In Harvard Business Review for November 2003 there are five featured articles. The first article explores the mind-sets necessary for a manager to achieve seemingly contradictory imperatives. The second article shows how to navigate the multidimensional universe of negotiation. The third article focuses on the lost art of arbitrage and all its possibilities. The fourth article provides a step-by-step guide for tracking nonfinancial measures that drive financial results. The cover story this month explains how the best business strategists use analogies to make sure their decisions lead to a breakthrough, not a disaster. Also we�ll take a look at the importance of understanding the transformative power of your own leadership, as well as how to strategically manage unforeseen risks that can devastate your company�s growth. In this month's cover story, we'll hear about understanding your own company's "stronger hand". Also, we�ll hear articles about smarter marketing research, managing your employees with authenticity, and how to ensure that the right people are doing the right things in strategically critical jobs. In this month's issue, there are four featured articles. The cover story reveals the surprises faced by new CEOs, and how to overcome them. In the second article, we examine industry change trajectories and how they affect investments. Then, the HBR Spotlight on The Twenty-First Century Supply Chain features two articles. The first examines a new way to approach the supply chain. The second looks at Whirlpool's successful supply chain turnaround. 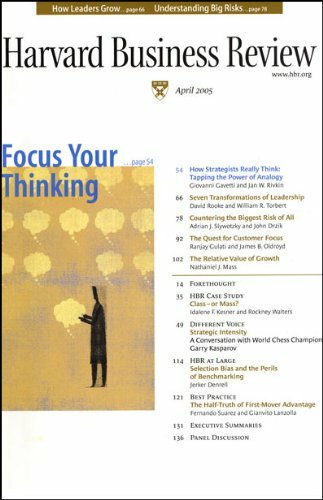 In this edition of the Harvard Business Review for April 2003, there are four full-length feature articles and five executive summaries. First, a look at luxury items targeted for the middle class. Second, bring R & D into services to make them more efficient. Third, the 2003 HBR list of breakthrough ideas for tomorrow's business leaders. And finally, some specific recommendations on how to overcome the fear of feedback. In this edition of the Harvard Business Review for February 2003: a look at "Why Bad Projects are So Hard to Kill;" identifying "Who's Bringing You Hot Ideas (and How are You Responding)? ;" learn to negotiate in the spirit of the deal rather than the economic bottom line; and searching for the "Enemies of Trust" within your organization. 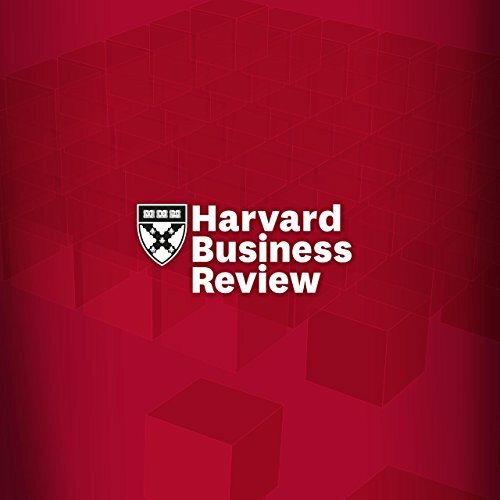 This article from Harvard Business Review explains how the language of leadership is misunderstood, underutilized, and more essential than ever. The author provides 4 essential strategies to use, as well as 4 tactics to avoid. This article, which originally appeared in the May-June 1998 Harvard Business Review, is offered in audio form exclusively through Audible. This cover story for this April 2004 issue presents the five hardball strategies you can use to ensure your company trounces the competition. Then, two articles look at organizational change. The first advocates for creating an ambidextrous organization that can respond quickly to changing environments. The second article takes a look at how operational innovation can bring out deep change in your organization. The fourth article this month provides tips on knowing when to walk away from the deal. First, we'll take a look at "Innovation Versus Complexity." Just what is too much of a good thing? Then, we'll hear about the leadership strengths of minority professionals, as well as about hiring candidates for smarts, rather than personality or style. Plus, we'll learn about sending your customer the perfect message at the perfect moment, and a mind and body expert answers the question "Are You Working Too Hard?" First, strategic resilience is not about responding to a onetime crisis or rebounding from a setback. It's about developing the capacity to change long before the case for change becomes desperately obvious. This month, the Harvard Business Review lists the four tough challenges standing in the way of your company's resilience in this turbulent age. Also in this issue: why hard nose executives should care about management theory, a look at what you can learn when business metaphors fail, and more. 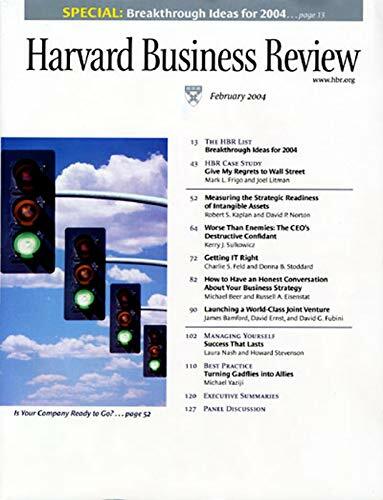 In this issue of the Harvard Business Review for March 2003, there are four feature stories. First, some companies learn to turn a profit from other company's bad customers. Second, learn how to better predict the disasters you should have seen coming. Third, Harold Leavitt explains "Why Hierarchies Thrive" in every type of organization. Fourth, find your innovation sweet spot when developing new products. And, finally, you'll hear executive summaries of the remaining articles. The cover story this month takes a look at creating successful new ventures within established business structures. Then, we'll hear about finding and encouraging so-called "positive deviants", the people in your company who are secretly initiating newer, better practices. Also, we'll find out about breaking free from the traditional product life cycle; as well as about the challenges facing today's business schools.